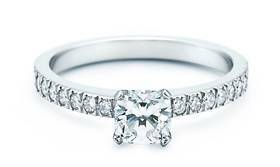 The Tiffany Novo Half Carat: clean and classic with a little bit a vintage flair. 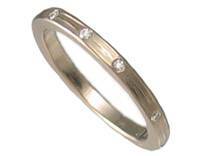 The Ayesha Studio Twinkle Band: simple and slick with a little bit of bling for added character. 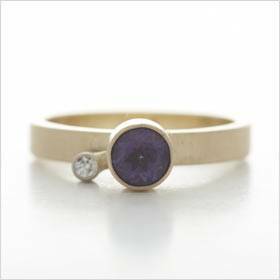 The Dawes Design Amethyst Orbit Band: super modern with a fantastic pop of color that adds personality for the more quirky bride. i heart novo. the dawes design is quite nice too. Wow! The Ayesha Studio Twinkle Band is almost exactly like my wedding ring! The diamonds are set a bit differently. Flush with the band, but I forget what they call the setting style. Pave-set? No that’s not it, but it looks a lot like it. Anyway, that was almost nine years ago! It’s nice to see the style around still.